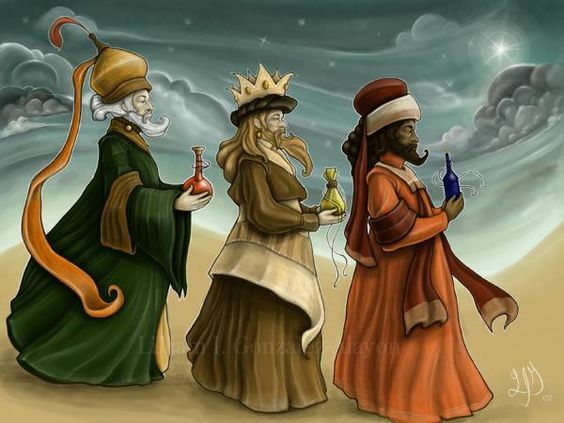 Today is Epiphany or Three Kings Day (although it might not be anymore by the time I’ve finished this post, at least not in this time zone), the celebration of the wise men bringing gifts to the baby Jesus. Well, that as well as the baptism of Jesus and sometimes the wedding at Cana, but it’s the three kings who tend to be remembered in western Christianity. In Spain and Latin America, they’re regarded as gift-givers who visit homes on this day. It’s apparently traditional to leave food and drink out for the wise men’s camels, as it’s the only day of the year when they eat. I wrote about these sages seven years ago, and mentioned that their traditional names didn’t come about until the sixth century. An eighth-century manuscript originating in Ireland and attributed to Bede but probably not actually written by him adds some details, and I’m not quite sure which ones were introduced in which work. 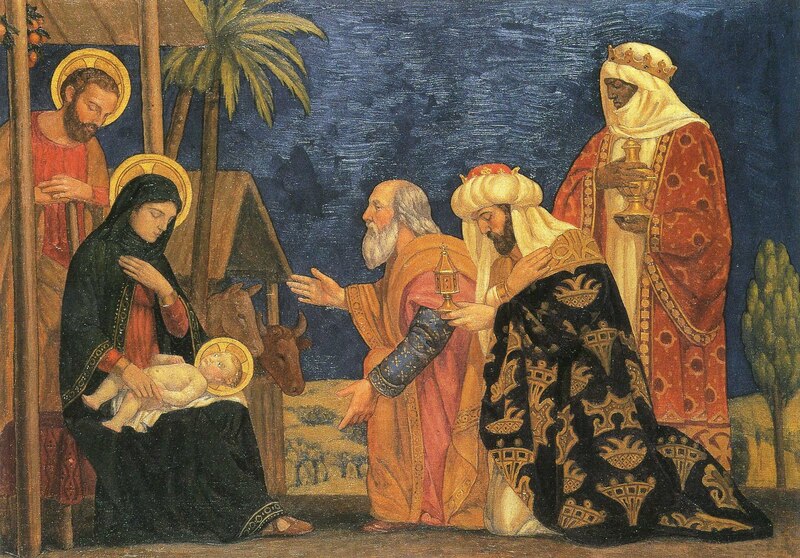 The term “magi,” which the Gospel of Matthew uses, refers to the Persian priestly class, who were astrologers. It’s where we get the word “magic,” even though this came to encompass supernatural arts that Zoroastrian priests would have considered blasphemous. As such, the initial idea seems to be that the three of them are all from Persia, but they later came to be associated with more far-flung lands. They also were often referred to as kings rather than priests, likely because it was a good bit of symbolism to have foreign rulers worshipping Jesus. It’s been linked with passages in Psalms and Isaiah about people from many nations coming to Israel to pay homage to God and the king. Melchior, the oldest of the three, was the King of Persia and brought the gold. Gaspar, who brought the frankincense, was either from India or Tarsus in modern-day Turkey. Pretty significant difference there, I’d say. It’s thought that his name might derive from that of Gondophares, founder of the Indo-Parthian Kingdom in Pakistan and Afghanistan. Balthazar, described as having a black complexion and heavy beard, was from Arabia, Babylon, Yemen, Ethiopia, or Egypt. Apparently he became increasingly associated with Africa over the years due to that mention of his being black. In Spain, he’s traditionally portrayed by someone in blackface. 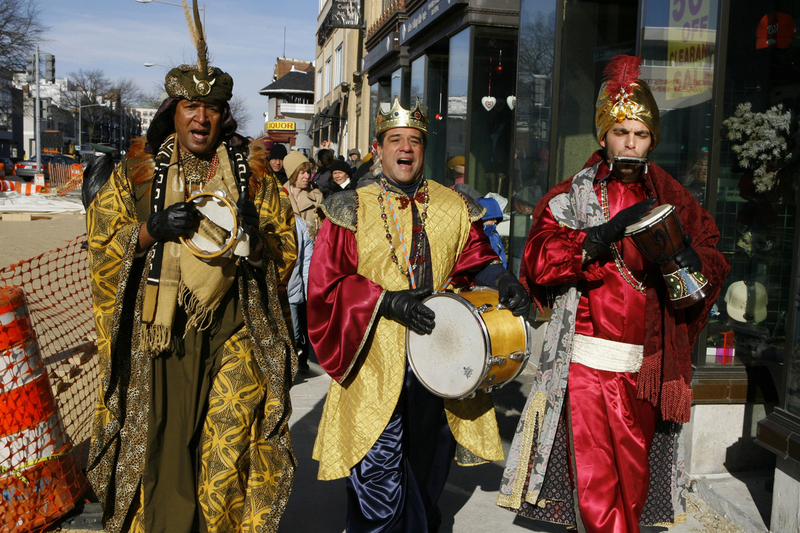 No worse than Zwarte Piet in the Netherlands, I suppose, but why does Christmas have to be racist? At least one tradition said that, at the time of the nativity, they were sixty, forty, and twenty, respectively. As such, they represented three different stages of life. Not surprisingly, however, which one was which age and brought which gift varies in the telling. It’s sometimes said that one (if not all three) was from China, but I don’t know that there’s any consensus on which one. In Christopher Moore’s Lamb, a comedy that references some actual traditions, Balthazar lives in Kabul, Gaspar in China, and Melchior in India. 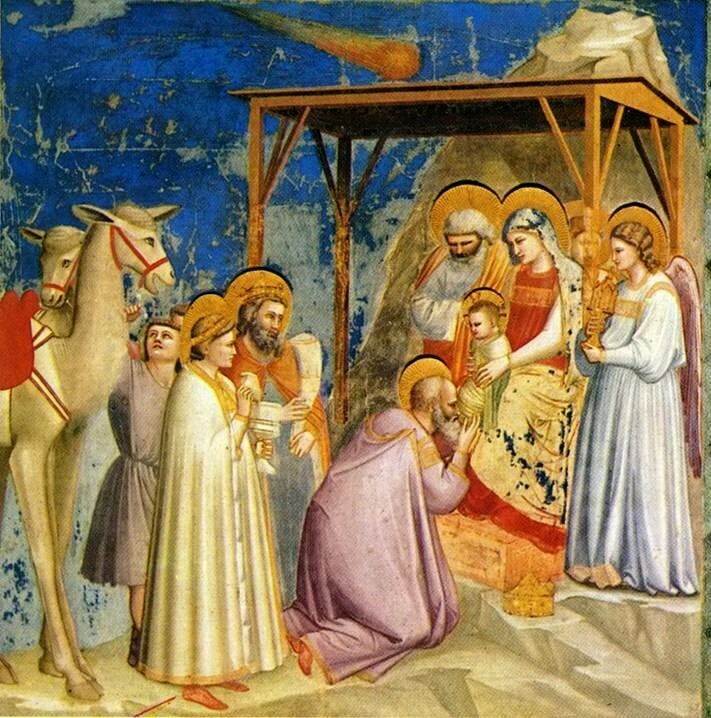 There have been numerous interpretations for the star that the magi followed to find Jesus, including a comet, a supernova, or a conjunction of planets. The text is pretty vague, really; they tell Herod that they saw the star representing the future King of the Jews (if that’s referring to an actual prophecy, it’s too bad that didn’t survive), and Herod’s priests and scribes say that the Messiah was to be born in Bethlehem. The same star then somehow guides the magi to the house where Mary and Joseph are living with the young Jesus, stopping right above it. Or maybe they were just tired of walking and just chose a random building. This XKCD page gives a tongue-in-cheek but presumably scientifically sound analysis of what would actually happen if they had followed a star or planet. Matthew mentions a house, not a manger or a cave. And since Herod orders the execution of children two years old or younger, it might have taken the magi that long to get to Jerusalem, suggesting a starting point farther away than Persia. But then, it apparently took Moses forty years to walk a much shorter distance. If the star had been in the sky for two years, though, wouldn’t more people have noticed it? While attempts to rationally explain the events in the Bible can be quite clever, I don’t think they’re always necessary. 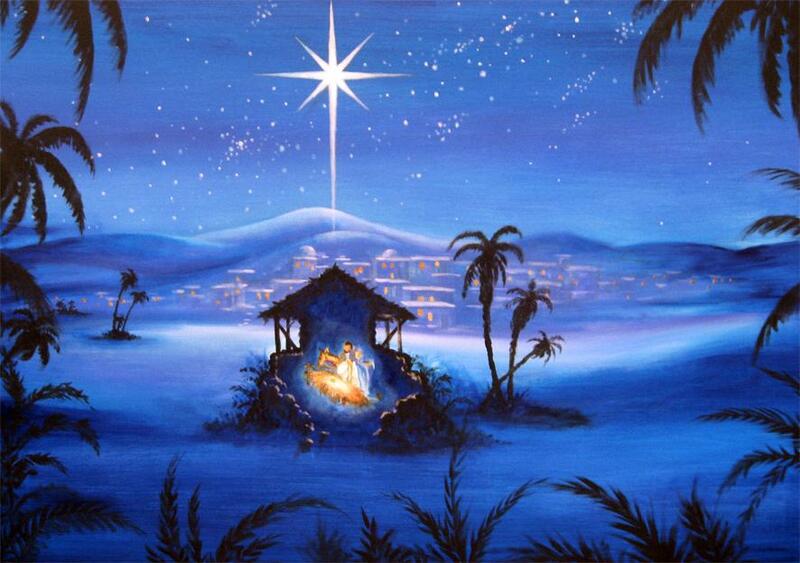 If Jesus really was the Son of God, then the star was miraculous and wouldn’t have behaved naturally. Alternatively, if the whole story was made up, the writers could have had the star do whatever they wanted. The wise men almost certainly wouldn’t have visited at the same time as the shepherds, but I think we can forgive nativity scenes for taking some liberties for the sake of art. An angel tells the magi in a dream not to return to Jerusalem, so they take another route back home. Later stories say that they were baptized in India by St. Thomas, and that many years later they met in Armenia to celebrate Christmas (although I don’t think they would have called it that). They all died a few days later, in January of the year 55 AD, all at over one hundred years of age. Obviously this doesn’t fit with the account that Balthazar was only twenty when he went to Bethlehem. Balthazar’s death was specifically identified as taking place on 6 January. Constantine‘s mother Helena later took their remains and relics to Constantinople. If the stories about her are to be believed, she took pretty much everything related to Jesus back with her. They were then moved to Milan, and finally to Cologne by Emperor Frederick Barbarossa in 1164. There’s some dispute on this, as Marco Polo reported that the three were buried in Persia. Another legend claims that the original gifts have been kept in Greece since the fifteenth century, and that they had been on display in Constantinople prior to that. It’s fascinating how these tales develop, and how a brief account of astrologers bringing gifts to Jesus developed into a story that not only included specific details about who these men were, but led people to claim that their churches had things that had belonged to them. This entry was posted in Art, Authors, Catholicism, Christianity, Christmas, Christopher Moore, Eastern Orthodox, Holidays, Magic, Mythology, Prejudice, Religion, Zoroastrianism and tagged balthazar, bible, blackface, camels, constantine, dia de los reyes, emperor frederick barbarossa, epiphany, gaspar, gondophares, gospel of matthew, helena, herod the great, isaiah, jesus, lamb, magi, marco polo, melchior, psalms, racism, relics, st thomas the apostle, three kings day, three wise men. Bookmark the permalink. “The modernists’ conclusions have been bolstered by two thousand years of the magi tradition being elaborated like no other gospel story. Influenced by Zoroastrianism and the Kaballah, the Gnostics in the second and third century picked up Matthew’s story of the magi and ran with it. With their fascination for fantasy stories, far-out theories and fantastical theologies, the idea that mystical magicians from the mysterious land of Persia visited the Christ child was too magically marvelous to resist. In the Revelation of the Magi, I think the star literally BECOMES Jesus. Or maybe Jesus becomes the star; I’m not sure of the order.